The Swish Stud chrome curtain pole in 35mm diameter is part of the Elements collection. 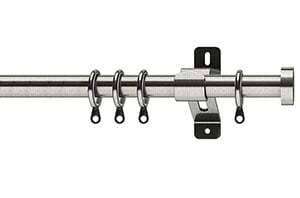 The Stud curtain pole comes with a small simple end finial. 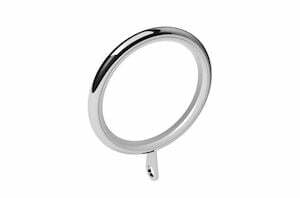 The rings are nylon lined, allowing them to glide quietly and smoothly when opening and closing your curtains. 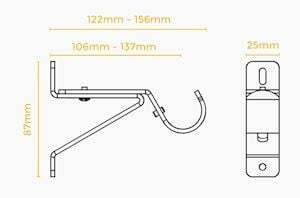 Strong metal wall fix brackets are supplied, which are adjustable and allow you to set the distance between the curtain pole and the wall to suit your window. 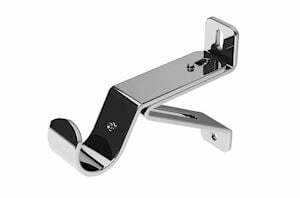 Our metal curtain poles can be easily cut to size for a perfect fit using a small fine tooth saw. Simply remove the finials first by loosening the tiny colour coordinating grub screw with the supplied allen key and then cut down to size.